Growing up, everyone hears that you should not judge a book by its cover, but in the case of businesses, corporations and even our university, image is everything. The Strategic Priorities Steering Committee was created by Chancellor and President Dr. Carine Feyten in Spring 2015 who tasked them with the goal of creating a strategic plan for the university by May 2016. 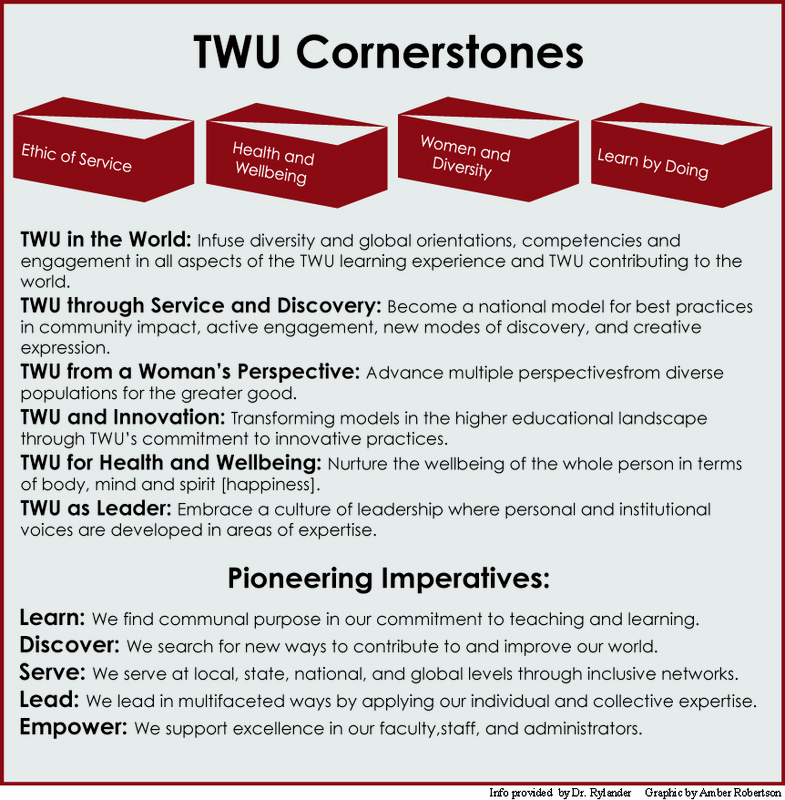 In her press release to the TWU community, Feyton explained the purpose of the committee: “To clarify our core purpose and help the TWU community explore opportunities and options.” The end result is to create strategic goals for the university, similar to a 10-year plan, that will align with a specific purpose. Professor of Marketing Dr. David Rylander and Executive Director of Campus Alliance for Resource Education Amy O’Keefe currently serve as co-chairs for the committee. Rylander was able to explain the stages of strategic planning and share what the committee has discovered so far. Both co-chairs presented their progress at the Board of Regents Meeting Feb. 19. Rylander said that in April 2015, the committee held an initial retreat for members of the TWU community to brainstorm what they felt was the purpose and mission of the university. Rylander commented: “The all-day retreat generated hundreds of ideas and concepts and terms. That was a start and from there we started working on narrowing down the most common ones we’re seeing, which ones were the most important ones to TWU.” The strategic planning process, unlike other methods, is nonlinear and requires the inclusion of staff, faculty, administration, students and other experts. Since then, the committee has had a summer retreat and several meetings to identify the central themes. Rylander shared: “We ended up coming up with a set of principles and cornerstones of the university and a set of imperatives that we are working on organizing right about now.” The four cornerstones include ethics of service, women and diversity, health and wellbeing, and learn by doing. The imperatives developed thus far include learn, discover, serve, lead and invest; each of these terms are being defined and molded. The strategic plan will become the guide for future university decisions and activities. Each department will have to develop a specialized strategic plan based on the major goals once the draft is finalized. Implementation is expected to occur sometime in Fall 2016.